In April 2011, researchers found and Apple confirmed that iPhones and iPads collected information related to the device's location, often storing this information for a year or more. These records show where the device is on a regular interval, in some cases recording its location every few minutes. People are generating data like this every day through their devices, and in many cases, are unaware of the fact that this collection is occuring. While companies have the right to collect information about their customers, those customers are partners in that data's creation, and should therefore be allowed to have access to and use of that data. This data from iPhones and iPads is the first to come in such a usable format. It represents a valuable dataset for all kinds of location-based research. openpaths.cc is an encrypted, user-contributed database for the personal location data files recorded by iOS devices. Users can securely store and manage their personal location data, and grant researchers access to portions of that data as they choose. 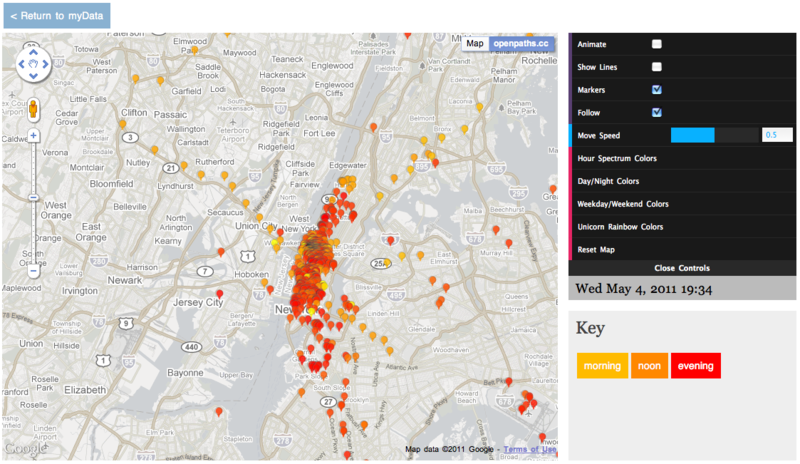 openpaths provides mapping tools that show what locations are stored within a user's files. Users can submit their data to any research project that requests it, or they can choose to keep their data completely private and just use the visualization tools for their own purposes. Location data are stored separately from user profile or demographic information, and cannot be linked without the user's express permission. Users can export their location data in text-based formats, which they can use in many other ways. Users may choose to remove their data from openpaths at any time.